in Social Media with tags #upcycledfashion, Etsy, Facebook, instagram, Kraft Cheese, oreo, Pinterest, Snack Hacks, Tailwind, TerraCycle, Twitpic, upcycle, Upcycling Both comments and trackbacks are closed. “Upcycling,” or the creation of new objects from old or used items, is the latest craze in sustainable living. Spurred by the continued growth of the blogosphere and new platforms that are ripe for inspirational visual content (think Instagram and Pinterest), upcycling is quickly becoming a cultural movement driven by digital content. Per the Oxford Dictionary, the key attribute of an “upcycled” product is that the result is of higher quality or value than the original. In short, enthusiasts of the trend ascribe to a “higher order” of recycling in which reused items are reincarnated in a better state than they were in before. Upcycling represents the intersection of sustainability and art, and therefore plays well within digital platforms known for showcasing and inspiring via visual content. Digital agency 360i’s Insights group took a closer look at the growth of the upcycle movement, digging through the data to learn more about the trend and what opportunities exist for brands. Why is this an opportunity for brands? Consumer demand for upcycled content is on the rise. As evidenced in the chart below, search queries for “upcycle” and “upcycled” have grown steadily from 2009 to present. 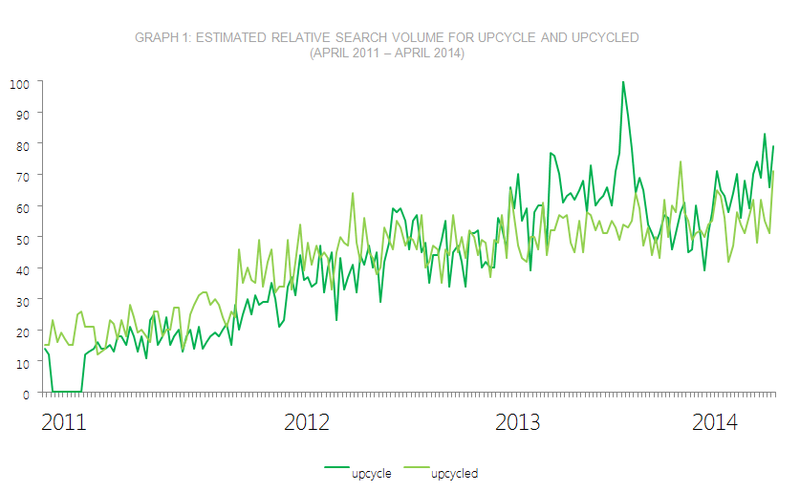 Source: 360i Analysis of Google Trends April 2014 for data spanning April 2011 – April 2014 for keywords “upcycle” and “upcycled.” Numbers represent search interest relative to the highest point on the chart. If at most 10% of searches for the given region and time frame were for “pizza,” we’d consider this 100. This doesn’t convey absolute search volume. In addition to search queries, social media conversations for “upcycle” and “upcycled” are on a similar upward trajectory. Graph 2 below visualizes 360i’s analysis of relevant conversations across blogs, forums, public Facebook profiles and Twitter from 2011 to 2014. Source: 360i Analysis of the social media landscape conducted April 2014 for data spanning January 2011 – April 2014; Volume Sample Size: Full estimated population of posts from blogs, forums, public Facebook profiles and Twitter. How is the content being shared? One way people are sharing upcycled projects is through images. 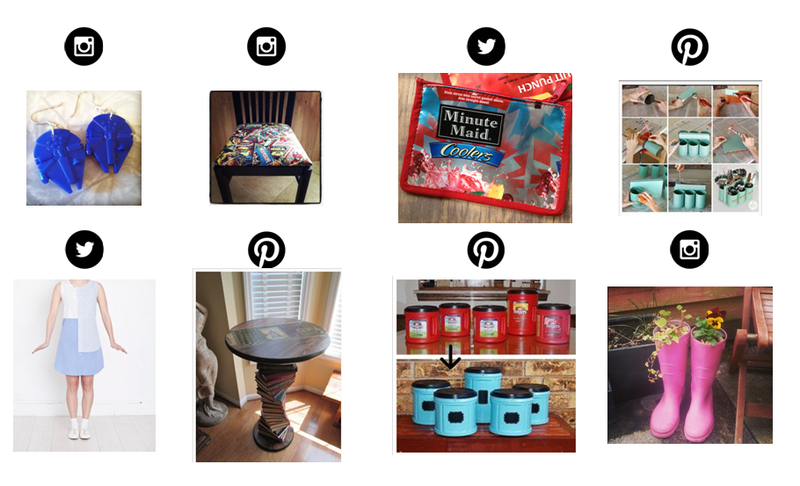 We qualitatively looked across Instagram, Pinterest and Twitpic to see how people share images about upcycling. On Instagram, the top ten tags for “upcycle” represent more than 200,000 photos. Graph 3 shows a breakdown of the types of tags relevant to this term. For the most part, people are using #upcycle and #upcycled to designate that the image shared is a newly restored version of an old product. Other tags specify the type of upcycling at play, for example #upcycledart or #upcycledfashion. 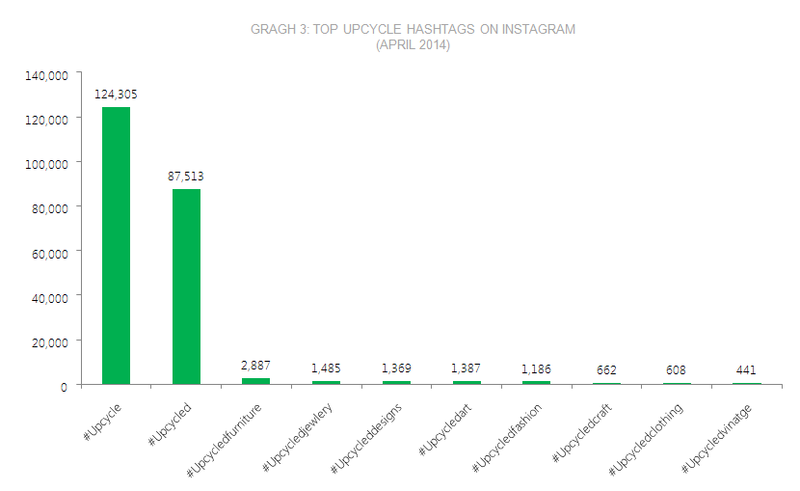 Source: 360i Analysis of Iconosquare (formally known as Statigram) April 2014 for keyword Upcycle. An analysis of Pinterest content using Tailwind showed that most “upcycle” and “upcycled” pins derive from Etsy.com. 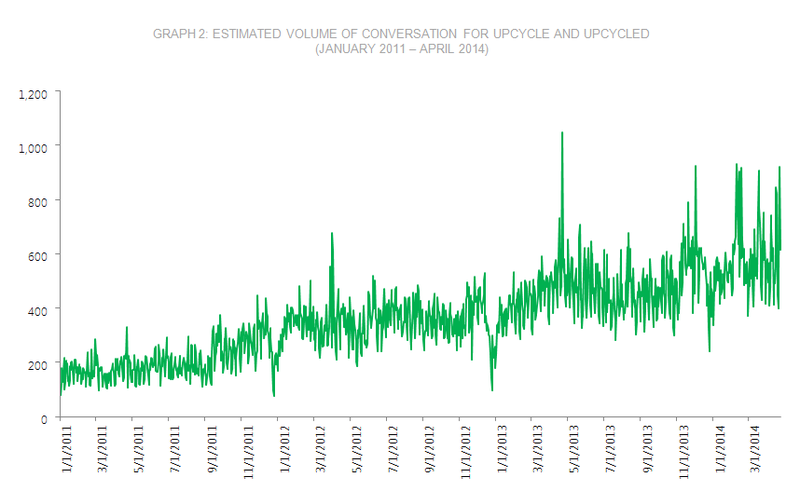 The chart below shows a sharp rise in upcycling mentions starting at the beginning of April, perhaps indicating some momentum ahead of Earth Day (April 22) and the beginning of spring. We also were able to identify patterns across the images shared. Upcycling content across Instagram, Twitter and Pinterest tended to fit within four categories: Fashion, Furniture, Remixing and Crafts. The idea of remixing old items was most interesting because some of the content involved common CPG brands and household items such as Minute Maid juice boxes and Folgers coffee cans (see below). Source: 360i Analysis of Tailwind, Statagram, Twitter April 2014 for keyword and tags “upcycle” and “upcycled.” Author image credits listed from left to right. First Row: @abbyislemon on Instagram, @stitchworth on Instagram, @FairTradeStore on Twitter, Pinned from projectgreenfy.com. Second Row: @LoveMeAgain on Twitter, Pinned from TheFunkadelicRelic on Etsy, Pinned from hometalk.com, @aileenhay on Instagram. In fact, consumer interest in remixing is what inspired Oreo’s recent “Oreo Snack Hacks” campaign (client), in which the brand invited popular chefs to create Oreo-hacked recipes from Oreo tortilla chips to Oreo fried chicken. Fans can also submit their ideas on the Oreo Tumblr page. Research analysis around the “upcycling” trend provides some key takeaways for marketers interested in connecting their brands to this trend. In order to ensure this movement is the right opportunity, marketers will want to confirm that their audience would identify with upcycling and align their content strategy with the places and ways in which people are sharing. Marketers looking to incorporate upcycling into their digital strategies can capitalize on the trend by providing added value to the conversation and using relevant keywords in their content. For example, 360i client Kraft Cheese recently partnered with TerraCycle (an organization committed to recycling/upcycling) to recycle more than 1.2 million pieces of cheese packaging for Earth Day, and shared this map on Facebook highlighting the top donating states. Evann Clingan, Insights Analyst at 360i, contributed to this post.